High ammonia affects broilers in many ways. 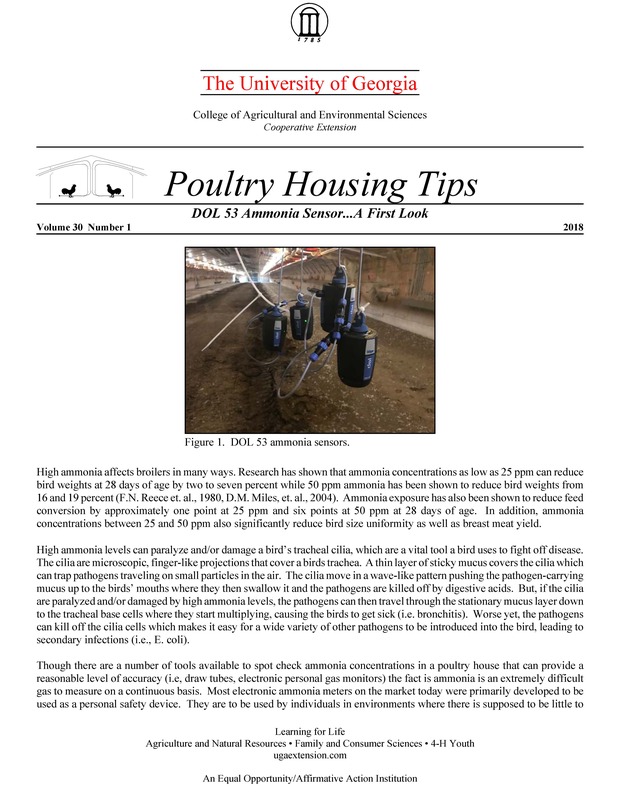 Research has shown that ammonia concentrations as low as 25 ppm can reduce bird weights at 28 days of age by two to seven percent while 50 ppm ammonia has been shown to reduce bird weights from 16 and 19 percent (F.N. Reece et. al., 1980, D.M. Miles, et. al., 2004). Ammonia exposure has also been shown to reduce feed conversion by approximately one point at 25 ppm and six points at 50 ppm at 28 days of age. In addition, ammonia concentrations between 25 and 50 ppm also significantly reduce bird size uniformity as well as breast meat yield. High ammonia levels can paralyze and/or damage a bird’s tracheal cilia, which are a vital tool a bird uses to fight off disease. The cilia are microscopic, finger-like projections that cover a birds trachea. A thin layer of sticky mucus covers the cilia which can trap pathogens traveling on small particles in the air. The cilia move in a wave-like pattern pushing the pathogen-carrying mucus up to the birds’ mouths where they then swallow it and the pathogens are killed off by digestive acids. But, if the cilia are paralyzed and/or damaged by high ammonia levels, the pathogens can then travel through the stationary mucus layer down to the tracheal base cells where they start multiplying, causing the birds to get sick (i.e. bronchitis). Worse yet, the pathogens can kill off the cilia cells which makes it easy for a wide variety of other pathogens to be introduced into the bird, leading to secondary infections (i.e., E. coli). Though there are a number of tools available to spot check ammonia concentrations in a poultry house that can provide a reasonable level of accuracy (i.e, draw tubes, electronic personal gas monitors) the fact is ammonia is an extremely difficult gas to measure on a continuous basis. Most electronic ammonia meters on the market today were primarily developed to be used as a personal safety device. They are to be used by individuals in environments where there is supposed to be little to no ammonia to alarm when ammonia levels are high, such as rooms with ammonia refrigeration systems. These meters were not developed to be used in an environment where moderate levels of ammonia are constantly present as is the case with poultry environment. Essentially all portable electronic ammonia meters utilize an electrochemical sensor. Ammonia reacts with the chemicals in the sensor which results in current that is proportional to ammonia concentration in the environment. The higher the ammonia concentration, the greater the chemical reaction, the higher the current produced. When the typical ammonia electrochemical sensor is left in a poultry house for a extended period (hours or possibly days) the sensor tends to become “saturated” with ammonia, resulting in an under-reporting of actual ammonia levels. The higher the ammonia level, the faster the sensor becomes saturated and more likely they will indicate that ammonia levels are lower than they actually are. Furthermore, since it is a chemical reaction that is used to measure ammonia concentration, and there is a limited amount of chemical solution in a sensor, the life of the sensor can be very limited when used for extended period of time in an ammonia laden environment. Recently there has been a new type of electrochemical ammonia sensor that was specifically developed for continuous use in livestock facilities (Figure 1). The DOL 53 ammonia sensor is intended to be connected to poultry house controllers, allowing producers to monitor or possibly even control minimum ventilation rates based on ammonia concentration measurements made by the sensor. The manufacturer reports the sensor is capable of measuring ammonia accurately between 1.5 and 100 ppm. The sensor is design to be connected with a poultry house environmental controller. The sensor does not have a display, but rather it produces a 0 to 10 volt signal which is proportional to the ammonia concentration which an environmental controller would use to calculate and then display the ammonia concentration in the poultry house. The sensor does not need to be calibrated and the ammonia sensing element within the sensor is advertised to have a life of up to three years. The sensor has a suggested retail price approximately $1,000. The ammonia sensing element can be replaced at a cost of approximately $700. To evaluate the accuracy and life of the new sensor, a study is being conducted in a 40' X 500', totally-enclosed broiler house on a commercial broiler farm near Madison, Georgia. The first trial was conducted in December 2017. A single DOL 53 ammonia sensor was installed two feet above the floor, 12' from the side wall, in the center of the house, approximately eight days prior to catching. The DOL sensor was connected to a data logging system which recorded ammonia concentrations, along with house temperature and humidity, every minute. To evaluate the accuracy of the DOL 53 sensor, a Chillguard photoacoustic ammonia meter was installed in a control room located near the center of the broiler house. A small diameter sampling polyethylene tube was run from the Chillguard unit in the control room to the DOL sensor location to insure that the DOL sensor and the Chillguard unit were measuring ammonia concentrations at the exact same location. Photoacoustic meters are a highly accurate method of measuring ammonia as well as other gasses with a typically accuracy of +/- 1 ppm and as a result are typically used by university researchers when precise ammonia concentrations measurements are required. The high-accuracy measurements come at a high price. Photoacoustic meters typically cost approximately $10,000, and as a result are not a practical tool for poultry producers. The Chillguard unit was connected to the same data logging system as the DOL 53, temperature, and humidity sensors. Over the short trial period it was found that at low ammonia concentrations, less than 15 ppm, the Chillguard unit and the DOL 53 sensor typically measured ammonia concentrations within a couple of ppm of one another (Figure 2). But, when ammonia levels rose into the thirties, as indicated by the Chillguard unit, the DOL 53 sensor indicated ammonia concentrations between 6 and 10 ppm lower. After the birds were sold and ammonia levels climbed to over 50 ppm, the DOL sensor indicated the ammonia concentrations were 10 to 15 ppm lower than that measured by the Chillguard unit. When ammonia readings were analyzed for the entire 10-day period, it was clear that as ammonia concentration increased, the accuracy of the DOL 53 sensor decreased. A second trial was conducted beginning in late January of 2017. Over the course of the flock the accuracy of the DOL 53 was found to decrease as the flock progressed (Figure 3). For the majority of the flock, the DOL 53 sensor was indicating ammonia concentrations in the house were half as much as that indicated by the Chillguard unit. On January 31 the DOL 53 sensor was replaced with a new sensor and a second sensor was added which had been on use on another broiler farm for a few months previously. Performance of the new DOL 53 sensor was significantly improved over the original sensor, typically measuring within 5 ppm of the Chillguard unit. The same could not be said of the sensor from the other farm which significantly under-reported ammonia concentrations. As was seen with the original DOL 53 sensor in Trial 1, the accuracy of the second sensor decreased as ammonia concentrations increased (Figure 4). At the end of the flock all the DOL sensors were returned to the manufacturer for testing and analysis. After the analysis of the returned ammonia sensors, the manufacturer uncovered a quality-control issue with the manufacturing process of one of the sensor’s components which resulted in a significant percentage of the sensors produced to lose accuracy as ammonia levels increased. The quality-control issue was addressed and after approximately three months of factory in-house testing, the manufacturer sent five new DOL 53 sensors for field testing in September of 2017. In the third trial the five DOL 53 sensors, along with the sampling tube from the Chillguard unit, were placed the same as in the first two trials, The installation of five DOL 53 sensors allowed the examination of possible variation in ammonia measurements between sensors as well as a better ability to evaluate sensor life and reliability. Over the course of the six-week flock there was high level of agreement amongst the five DOL 53 ammonia sensors as well as between the DOL sensors and the Chillguard photoacoustic unit (Figures, 5, 6 and 7). Variation among the five DOL 53 sensor ammonia measurements was typically less than 5 ppm. As was seen in the first two trials there was a tendency for the DOL sensors to indicate ammonia concentrations were slightly lower than the Chillguard unit. The difference in readings between the Chillguard unit and the DOL sensors tended to increase as ammonia concentrations increased, but unlike in the first trail, the differences tended to be minimal, less than 5 ppm (Figure 7). Trial 4 was begun in December of 2017. To insure the accuracy of the Chillguard’s ammonia measurements a second Chillguard was installed. Ammonia measurement made by the two Chillguard units over the course of the flock were typically within 3 ppm. Due to technical issues ammonia measurements were not begun until the 10th day of the flock. As seen in Trial 3, there was a high level of agreement between the DOL 53 sensors and the Chillguard unit with variation between the two methods of measuring ammonia of less than 5 ppm. It was discovered that after the second week of the flock one of the DOL 53 sensors (#2) was reading consistently more than 5 ppm lower than the other four units (Figure 9). On January 6 a calibration check was performed on the five DOL 53 sensors and the two Chillguard units. Both 45 ppm and 81 ppm calibration gasses were applied to the units for five to ten minutes (Figures 10 and 11). With the exception of DOL sensor #2, all the sensors were within 3 ppm of the 45 ppm calibration gas and 4 ppm of the 81 ppm calibration gas. The two Chillguard units were within 1 ppm of the 45 ppm calbration gas and 3 ppm of the 81 ppm gas. At the end of Trial 3 the DOL 53 sensor #2 was replaced and sent back to the manufacturer for analysis. To analyze the overall accuracy of the DOL 53 sensor, the one-minute measurements for the DOL 53 sensors were averaged (excluding DOL sensor #2 for Trial 4) on a 15-minute basis, as were the measurement from the Chillguard unit. The Chillguard measurements were graphed versus the average DOL 53 measurements for both Trials 3 and 4 and a linear regression analysis performed. As expected, there was an extremely high level of correlation (R2 = 0.99) between the DOL 53 sensor and the Chillguard unit. On average, for Trial 3 the DOL 53 sensors read 2.52 ppm lower than the Chillguard unit and for Trial 4, 2.46 ppm lower. It is important to keep in mind that this doesn’t necessarily mean that Dol 53 sensors were measuring ammonia levels incorrectly. The Chillguard units themselves when well calibrated have an accuracy of +/-1 to 2 ppm. What can be concluded is that the Dol sensors readings were very similar to those made by a very expensive and precise Chillguard photoacoustic unit. The DOL 53 ammonia sensor has tentatively proven able to accurately measure ammonia concentrations in a poultry house on a continuous basis. The highly responsive sensor was capable of measuring ammonia concentrations within 3 ppm of the measurements made by Chillguard photoacoustic ammonia meter 67% of the time and within 5 ppm 95% of the time (Trials 3 and 4). There was a very high level of repeatability in ammonia measurements amongst four of the five sensors tested. Average variation between Dol 53 sensors (excluding unit #2) was 1.3 ppm. Though the DOL 53 ammonia sensor performed extremely well in initial poultry house field trials there are still questions as to its accuracy over the long term as well as whether it will last three years in a poultry house environment. Since the DOL 53 sensor is a relatively new product, if it is to be used to monitor the ammonia levels poultry production facilities it would be advisable to check the accuracy of the sensor a few times a year with a certified calibration gas (approximately 40 ppm).